I would like to describe with heartfelt thanks why I like the site that is to me a revelation and an adventure! My mother had a joking attitude toward reincarnation: "If you don't behave, I'll come back as a mosquito (or whatever) and bite you!" Europe, marriage and settling in a tiny town in a small, foreign country, raised my interest in it to another level. Although difficult foreign languages, a political regime of prohibitions and deprivations, low living standards and the grueling day to day struggle toward any sort of gain limited my trek toward spiritual growth. Ten years ago the borders fell away and we were free to pursue alternative ways of thinking. I obtained some instructive books in English, but still missed contact with people of like interests who spoke my mother tongue. I felt quite alone in my seeking and often wondered what in the world I was doing here in the first place. Last winter my Path found its way to Internet, and I saw that Out There, in the world I had left behind, was abundance, innovation, researching and knowledge, coupled with large doses of love and understanding from devoted individuals to be had at the click of a button. At my fingertips was an extraordinary array of possibilities for further enlightenment. As if in answer to my immediate needs, I discovered Past Forward. Soon many of my tenuous ideas about karma and reincarnation began clearing up, making way for a new perspective and broader awareness of what they can mean, plus the alluring chance to challenge some unanswered questions about myself and my isolation -- all available on one single site! Clicking randomly on interesting-looking links from another web site (The World Wide Online Meditation Center), I was first attracted to Past Forward by it's elegant and unpretentious graphics and design. It's discreet use of colors and the text of black print on a white background create the impression that here it is the messages, not the frills, that are important. But the frills, too, the drawings, are tasteful and appropriate to the themes. Fascinating titles offered me new concepts to assimilate, and just a few minutes of viewing various pages revealed an impressive vastness of vision and an extraordinary extent of knowledge. It must have taken years of research and experience to become so knowledgeable, or direct communication with Higher Forces! I saw at once the pleasure I was going to have delving into that material and learning from it! A tremendous sense of sincerity and dedication in the text binds my attention and makes me feel as though it is addressed to me personally, like an intimate letter from a dear and helpful friend. The articles, written openly and warmly, invite confidence and trust. I showed some of them to a local friend and proved their easy readability for people whose mother tongue is not English. The clear presentation of subjects follows a logical sequence, making it relatively simple for a newbie like me to click back and forth among the mazes of interesting items. And the Mega Index is a boon to people with little free time. True to its promise of "real human contact", I received an immediate, friendly reply to my first e-mail letter. 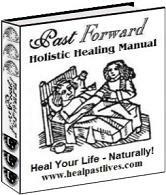 Hopes are instantly aroused by the Past Life Profile, of seeking relief from chronic problems and respite from life-long phobias and illnesses. And one's soul reaches out eagerly at the prospect of contacting one's Higher Self. Then there are the wonderful measures for self-healing, free for anyone to use, with their obvious truths that we were so cunningly able to ignore, until we are obliged, by the gently admonishing tones used throughout the site, to confront them. Although my exploration of Past Forward has already covered several hours, it continues to hold me spellbound, for at every click something new and instructive appears. I thank Fate for having led me to this site, and for the gift of being presented clear and honest aspects of karma, reincarnation and spiritual growth that had been lacking in the meager but complicated literature I have had to date, or in my own barren imaginings. I shall keep visiting Past Forward until the answers to some very old questions appear, but especially for the sake of basking in the feeling of love and care that seem to radiate from the screen when I am tuned in to it. Thank you, one and all! With warm and friendly greetings, Suzanne Kiraly"